So I went to toys r us on black Friday. I was actually blogging while I stood in the horrendously long line, you were going to get live blogging people! But my battery died, so sad for you. I still feel inclined to blog on my phone now though, so this should be interesting, double sad for you. Wait don’t leave! I’m still not sure what possessed me to try black Friday at an actual store. I’ve done it online, do most of our Christmas shopping online anyway. But last night, while it was still technically thanksgiving (not it’s so early it still feels like the day before, but 9 something or other PM thanksgiving day), found my sister in law and me a couple thousand deep in a line that started at toys r us, waiting for the doors to open at 10 o’clock. As we were walking with the throngs of people to add ourselves to the end of the line, I posted a typoed status update intended to say I was not sure if I was up for what I’d just got myself into. I didn’t know the half of it yet. Not to long after we got there, 10 o’clock came and we assumed they opened the doors, we were wrapped around too many buildings to actually see it happen. We started moving forward and not even half way there, the line stopped. Apparently the store was filled, already. We stood in line for almost two more hours. Oh but we did move again in those two hours, twice! Maybe even 10 yards one of time, ok maybe that’s a stretch. SPOILER ALERT, we never made it into the store.We were still a couple hundred people from the store when we left. If more than half the line didn’t leave the way we did, I’d estimate we had another two hours before we could start shopping. We walked outside the line to see the front of the store before we left. They had cops maintaining the peace and the entire front entrance was barricaded by store employees, including a guy standing in the automatic doors to make sure no one snuck in. Crazy. It wasn’t until the next morning, when Neil came home from the morning sales, that I realized we probably would have been in line another hour to get out of the store as well. Very happy we left, also happy we went. Next time, if there is a next time, I will have a full battery on my phone. Mercifully I was not alone in the cold. As my sister in law laughingly said when we got home, it was a bonding experience. So true, and next year, we can find a new way to bond. We put up the tree this weekend. I am amazed at how fun it was. I’d forgotten, since I’d ‘grown up,’ how much fun things can be when you aren’t under pressure to do them. I feel like instituting a new tradition around here, Christmas in November. So far we’re off to a good start on the holidays! The big kids helped me decorate the tree. Jena was putting every ornament on the same branch, but Grant, our resident decorator, was really getting into it. 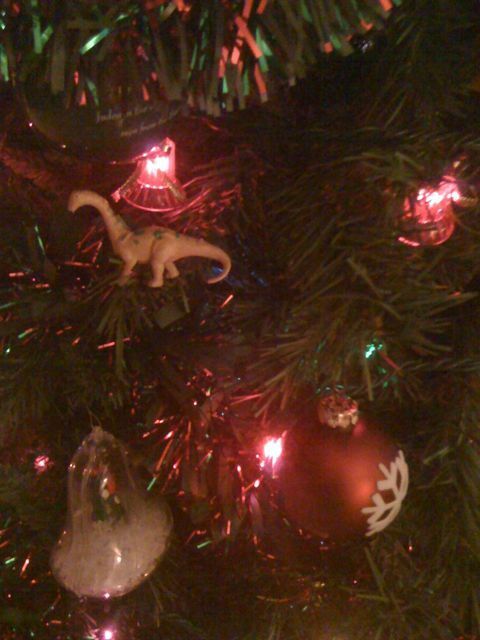 Tonight when I got home he informed he had continued to decorate the tree today. I wanted to show you a video of Grant at school today. However, it is on the Bycemaster’s phone, not mine, and as I previously mentioned, he is not home. You’ll like it though, whenever it gets here. He was a pilgrim, (Grant, not Bycemaster, though the thought of Bycemaster dressed as a pilgrim is highly entertaining, but I digress) he sang little turkey songs, with hand motions, I laughed a lot, he was cute. Our first Christmas gifts arrived this week. I cannot say what they are as at least one of the recipients regularly reads the blog, but they are really cute! I’m so excited about them, and I hope the people that get them will be too. How’s that for nice and vague! Which leads me to the holidays! They are upon us. I’m feeling very mixed about them this year, not that this is really anything new, the last decade of my life has brought less joy and more dread almost every holiday season. It’s a continual war to enjoy the holidays, and even writing that sentence feels wrong. This year however, we have new fun, grief, yay! As Thanksgiving approaches, a time when I had recently been seeing more of my grandfather, the loss is becoming more and more apparent. I’m just gratefully this isn’t the year I have Thanksgiving here, being at the in-laws will at least offer some relief. My parents are in the same grief boat, so they have no desire to add a second Thanksgiving into the mix. For both of those things I am very grateful. Life is a little crazy around here these days. I feel like I’m finally adjusting, I still don’t like it, but I’m at least used to working nights, not seeing my husband and waking up exhausted every morning to start it all over again. Last night I was so beat I fell asleep on the couch sometime circa 8:30, at least I hope it was at least 8:30. Combine that with a teething baby that seemed to actually sleep last night and kids that finally seem to be adjusting to the time change and well I feel awake. It shouldn’t be this much of a novelty. But I woke up to light out my window and my first response was not a groan. It actually took me a few minutes to recognize the foreign sensation of being awake, while still in my bed, that usually doesn’t happen till much later. So instead of going back to sleep this morning I’m writing you this horrible rambling post, I’m such a giver. Ok so maybe that title is a bit of wishful thinking. There are actually a lot of things I am guilty of, but, well, that’s not really where I want to go with this post. I’ve been realizing, again, how many needless things I feel guilty about. (Like right now, as I realized that this is not a new revelation to me, there goes the guilt again). It probably had something to do with being raised by a former catholic, my father, and a mother who can navigate the guilt trip with her eyes closed. But the more I talk to mothers, especially new mothers, I realize there’s something bigger going on than my family issues. Apparently our culture is breeding this nonesense. I’m not the only one! This is not entirely comforting however. The fact that I’m in good company kinda makes the situation more crazy. And since one of the primary purposes of this blog is therapy, I will now list some of the things I feel guilty about in any given minute. I let the kids brush their own teeth and only once a day! There, I feel better already. I actually realized, in making that list, that I could take a number of things off this list. Things I do that aren’t ‘approved’ of. I started to put them down, thinking I should feel guilty about them, and realized, I don’t. Woohoo! So in celebration, I DON’T feel guilty that I let my kids play in the dirt, or they all share a bedroom, or I only buy them one or two toys at Christmas, or we stay away from the doctor whenever possible, or I love all my kids differently or I sometimes fantisize about the day they’re all off to college and I have my husband all to myself! I think I’m going to try to add to the second list, or subtract from the first one, or at least not add to the first one, or not feel guilty if I don’t do either, or something like that.